In an article published Sept. 26th in Nature magazine, Hampton University planetary scientist William Moore and LSU geologist A. Alex Webb reveal new evidence for a period of Earth’s history that lacked plate tectonics and instead featured much greater volcanic activity. Calling this period “Heat-Pipe Earth,” the researchers show how frequent volcanic eruptions alter the surface and interior of the planet, creating a cold and strong lithosphere. Such a thick layer of cold rocks has been revealed by an analysis of Earth’s most ancient rocks and minerals, resulting in the long-standing “archaean paradox,” in which a young Earth which should have been hotter was instead found to be colder near the surface. A similar paradox was discovered at Jupiter’s moon Io, the most volcanically active body in the solar system. 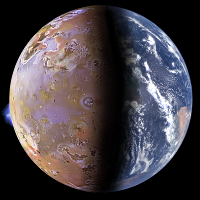 Despite Io’s record-breaking volcanism, many parts of its surface are cold and strong enough to support mountains up to 20 kilometers high. This coincidence of high volcanic heat flow and a cold, strong lithosphere lead Moore and Webb to apply a similar concept to the early Earth. This is how a key to Earth’s ancient history was found orbiting Jupiter! Articles describing this finding have been posted at Space.com, New Scientist, phys.org, LiveScience, and HuffPost UK. Nature also interviewed Dr. Moore to discuss this research at their weekly podcast.